If we keep going at this rate, soon we are going to have an archive, I'm not sure at what point a webcomic ceases to be 'upstart' and starts to be 'established', but when I am, I shall definitely write it down here for future prosperity. This one was actually one of the slowest drawn processes, and is obviously a well trodden joke, the physics behind the Pokéball has fascinated us all since Pokémon hit our fair shores...All except Harvey, who never played Pokémon. I light a candle for him every day. Simon once again proves his ability to be a main character, his overwhelming apathy not shielding him from the pencil, but rather making him a prime avatar for adventure. 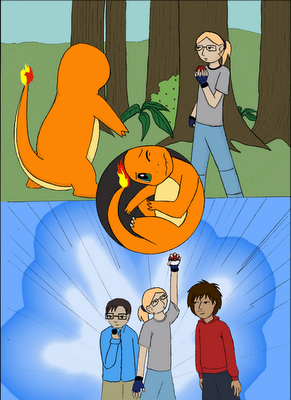 I quite like the effects on this one, the Charmander in the middle and the explosion of light coming from us in the 2nd panel are highlights. Simon is a big fan of the more silent comics as well, I'm fairly sure Harvey has never expressed his opinion one way or the other, and as he wasn't around for the heyday of Nerf Now, it isn't surprising, and I like both. Coming up soon will be some 'talkies', however, whether we continue along the talking path afterwards remains to be seen, I imagine it'll be a combination of both, mostly dependent on how much inspiration I receive from my blog mates and my artist. Until then, stay safe, and come back.